The worst ever water crisis in Shimla last fortnight was a manifestation of all that has gone wrong with priorities in developing this historic city, the capital of Himachal Pradesh. While Shimla is promoted as an international tourist destination without any assessment of its carrying capacity, the fragile hill city lacks basic amenities for even local residents, not to speak of tourists. Water is foremost among them, almost an all-weather problem. None of the state governments have, however, tried to have a permanent solution for this oft-repeated problem to make it a comfortable city for over 2 lakh residents and more than 35 lakh tourists who throng Shimla in different seasons to enjoy nature and heritage. Every year, in summer, Shimla faces a water crunch due to drying up of sources. In the monsoon, the silt level goes up reducing the efficacy of pumping at water schemes, and in winter, snowfall or dipping temperatures freeze the pipes. Unfortunately, both locals and tourists (mainly those who can’t afford lavish hotels) feel the pinch of such failures of the civic body as they are routinely subject to ‘water rationing’. (Water is generally supplied every third day). 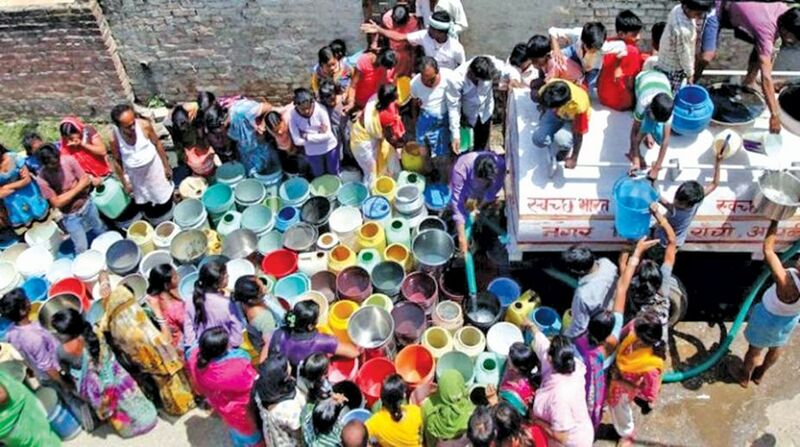 The situation became so alarming a few days ago that the government had to deploy police to accompany the water tankers to ensure disciplined distribution of water to anguished locals. The local residents and even some hoteliers were forced to post messages on social media to discourage tourists from visiting Shimla in May-June, the peak tourist season. “We had to politely tell our guests not to come, as we could not avert the water crisis. The hoteliers are not allowed to take additional water in tankers from the Shimla Municipal Corporation as per court orders. This time, we found it difficult to get even private tankers for the water sources around Shimla had dried up,” said Sanjay Sood, president of Hotels and Restaurants Association, North India. In the midst of this uneasiness and anxiety for water in a city, which has not many other alternatives having lost its natural sources of water due to individual capture over time, all that the government could do was monitor. The primary task was to streamline distribution, which has been flawed from the beginning with influential people getting more attention for this basic necessity in the past. The seconsd task was to augment water supply by plugging massive leakage (phenomenon occurring for long) and checking water availability at source. This has eased the situation for the time being but does not amount to long-term policy measures. “Tourism is the livelihood of thousands of locals. But what about other residents? The government needs to facilitate residents first and then promote tourism. With current policy, neither residents, nor tourists are satisfied with the facilities in Shimla. The government has failed to do the balancing act,” said C Prakash, a senior citizen. Shimla currently has a requirement of 42-45 million litres of water every day, which is never met. Against the routine availability of 30-35 MLDs, the city started getting less than half the requirement a fortnight back. The factors were dry spell, faulty distribution and leakage in water pipes. The overall failure has a long background of indifference towards futuristic development and the tendency of successive governments to permit and see Shimla outgrow its capacity of water connections vis a vis water availability. Established in the late 19th century, the erstwhile summer capital of British, Shimla was planned for a population of 16000 people. Over the years, though the city grew in population, the water supply schemes were not augmented. The uncontrolled construction, poor upkeep of water sources, congestion and loss of greenery have all led to haphazard development in Shimla amid flexibile policies of the government, which aimed at short term gains. There has been no serious effort at localised water harvesting as an alternate channel for water supply in different wards by the civic body, What has further aggravated the situation on water front is the closure of one of the five main sources of water for Shimla, Ashwani Khad, in 2016 after the worst ever jaundice outbreak claiming over 30 lives due to contaminated water supply. “Shimla needs a long-term solution. We are trying our best to work out a bigger water supply scheme from Satluj River with the help of the Centre,” said Chief Minister Jai Ram Thakur, who had to review water availability every day for about a week in the midst of the crisis, and who perhaps understood that a similar crisis may occur again if required steps are not taken now. “It’s not water alone. They will have to straighten many issues for all times to come,” blurted out angry Shimla residents. “Shimla has lost its original essence and character for lack of vision of policy makers who have made a ‘concrete mess’ of this historic city in the name of development. There are no walking spaces left due to haphazard construction, no charm left on The Mall (once a pedestrian’s paradise) that’s shrinking and is overcrowded with tourists, and there is no fresh air to breathe as the green area is disappearing,” they said. The tourists too are disenchanted in peak seasons and remain dissatisfied with limited facilities in Shimla, right from water to parking, which they need the most.